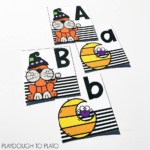 Alphabet recognition is an important skill for pre-kindergarten and kindergarten students. 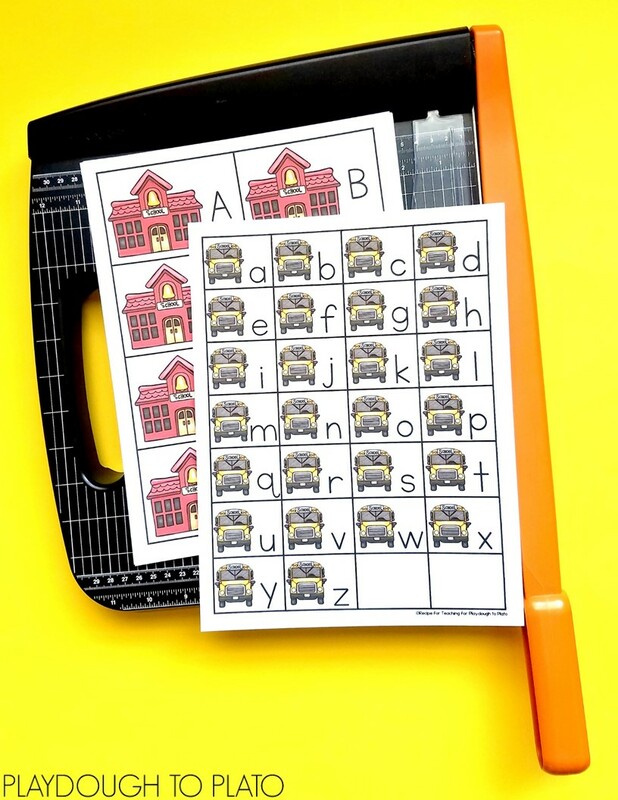 This School and Bus Alphabet Match is a fun way to work with uppercase and lowercase letters when heading back to school this fall. 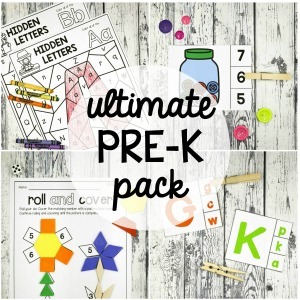 Scroll down to download your freebie, then make sure to hop over and snag out Zoo Name Games for more back to school fun. To prepare this activity, I first printed the cards on white cardstock. 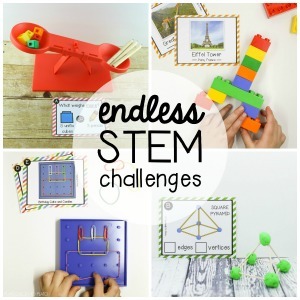 I love using cardstock for card matching activities because it is so durable for little hands. I laminated the cards and then used my paper trimmer to cut along the solid black lines of the cards. That’s it! 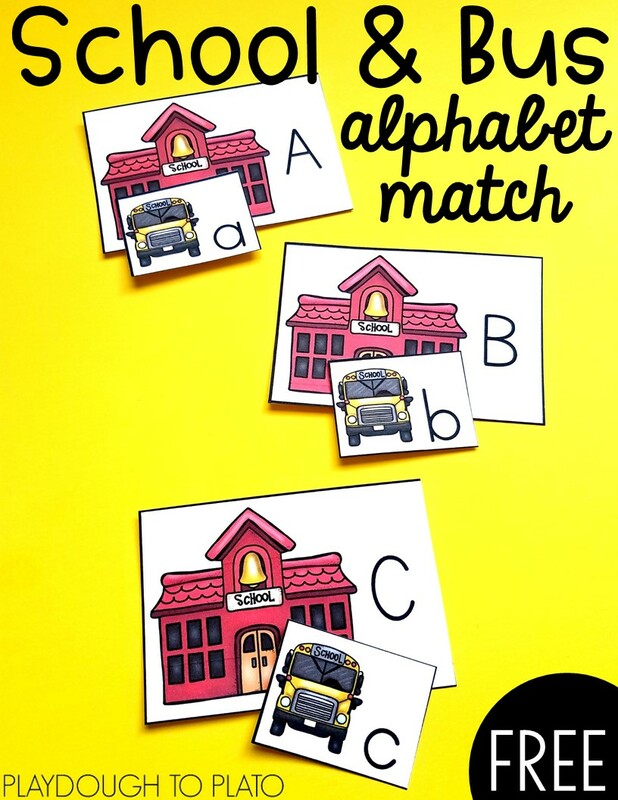 We were ready for some School and Bus Alphabet Match fun. To start, we first sorted all of the uppercase letter school cards into one pile and all of the lowercase letter bus cards into another pile. After we reviewed each of the letters, I had one student pick a card from the uppercase letter pile. 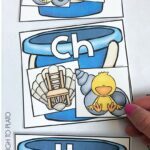 The first child picked an uppercase letter L card. 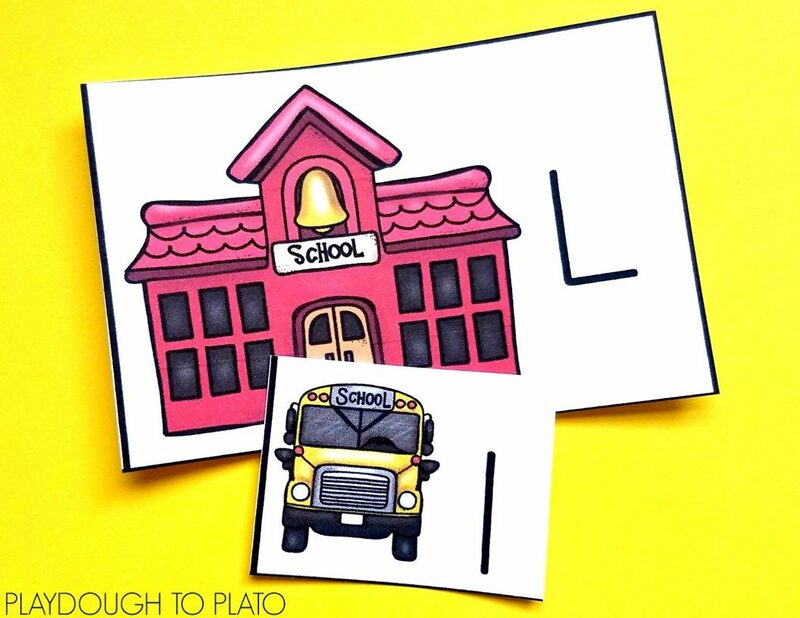 She searched through the lowercase letter pile cards until she found the lowercase letter l card, “drove” the bus card and “parked” it at the school card. We went around the small group table until all of the cards had been matched. 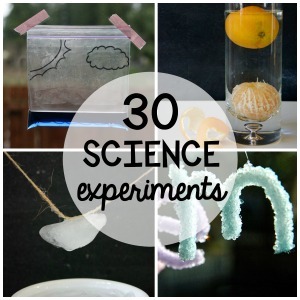 This activity can be easily differentiated to meet the needs of a variety of students! 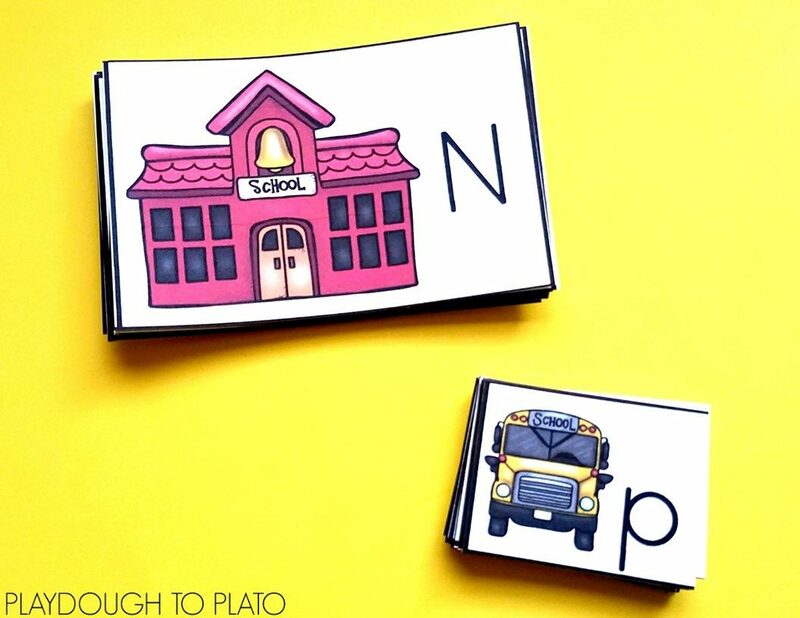 You can pull out the alphabet cards that your students need practice with and just work with those cards instead of using all 26 uppercase and lowercase letter pairs. 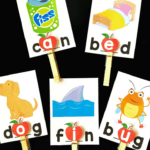 If some of your students are ready for letter sounds, you can have them name the letter and also say the sound that the letter makes. To take it another step further, they could come up with a word that starts with the letter! 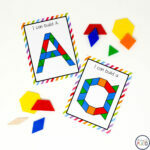 Ready for some alphabet matching fun?! 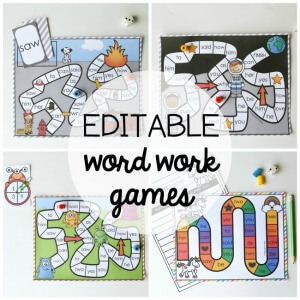 Scroll down and click the dark blue download button below to grab your set and then hop over and snag our free letter tracing roads for more reading motivation. 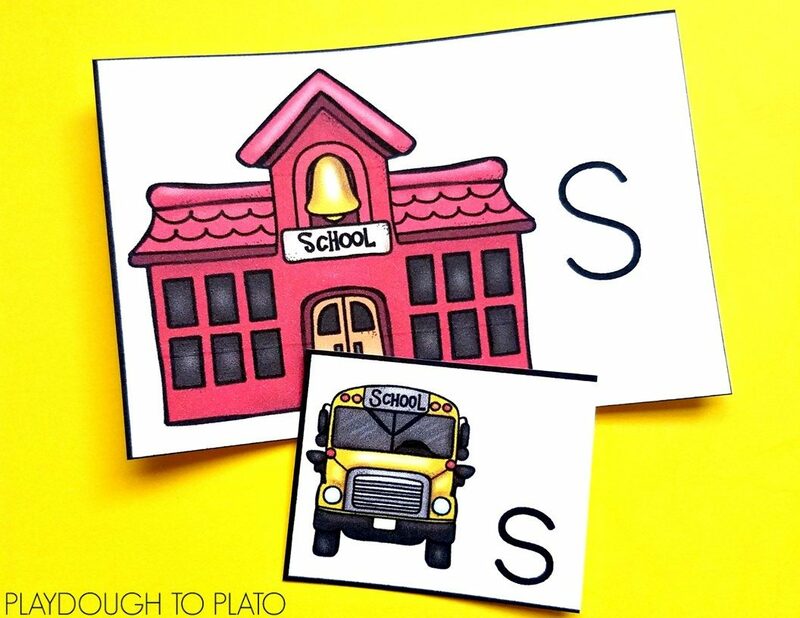 Many thanks and so appreciate your latest Alphabet/Bus resource, which I’m going to use for my Adult ESL students who come from Italy and Myanmar, and don’t speak a word of English. 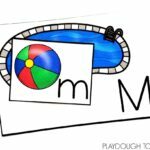 I’ve taught students from grade 2 – 6 and this is my ‘maiden voyage’ in ESL. Feel free to advise when you can, Heather. Thank YOU! Thank you, Celia, for all of your kind words. 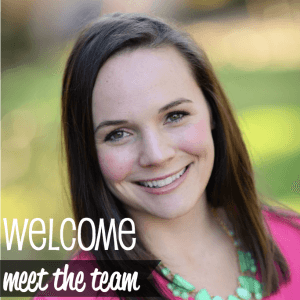 It sounds like you are off on a wonderful adventure. If I can help you find anything, please let me know. Thanks for reaching out, please check out our troubleshooting video HERE for help. 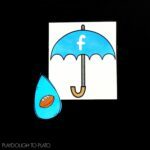 You most likely need to enable pop ups from our site or download Adobe Reader. Saw the video but not helps with my problem. How i can download the pdf then? I apologize, but if you can’t access Adobe Reader, I’m not sure how you will be able to download the pdf. I will check with my community manager on an alternate option. You’re welcome to email hello@playdoughtoplato.com for further assistance.